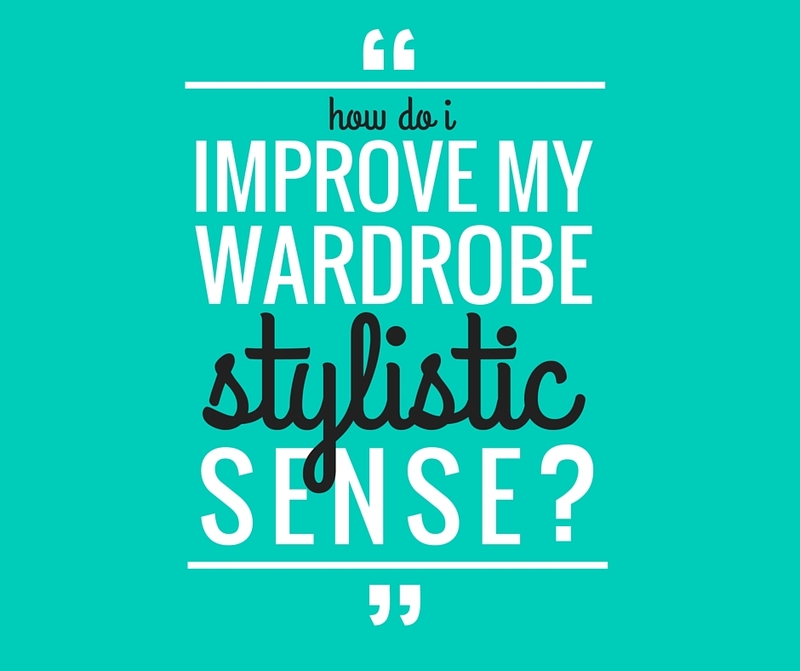 Reader Question: How do I improve my wardrobe stylistic sense? 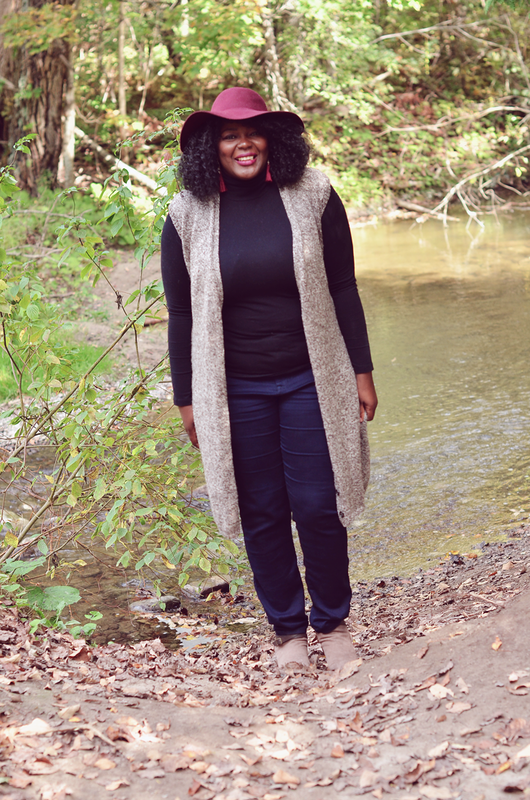 It’s Style Rehab week here on Thriftshop Chic. Take a look back at how you can use fashion as a fun tool to help you feel your awesomest and look for a fall wardrobe tweak and a kid’s capsule wardrobe later in the week! But her work wardrobe—corporate office in an Engineer-y field—is a tougher nut to crack. 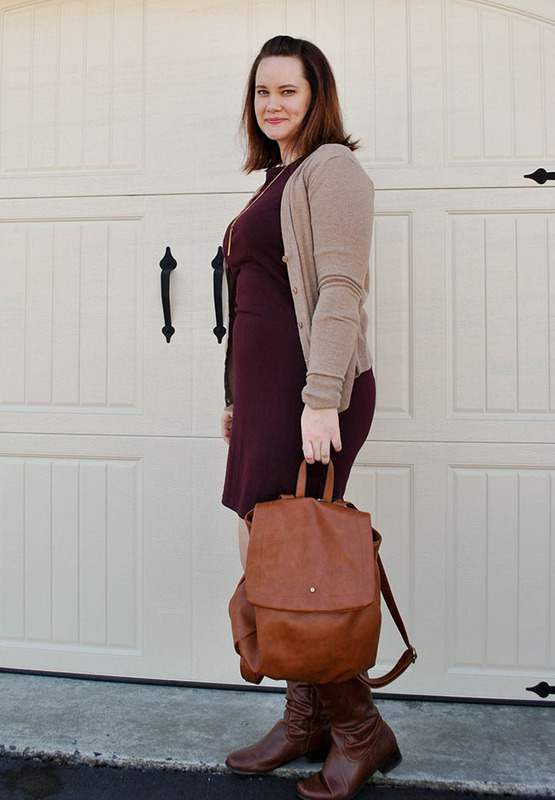 She needs plus-sized business casual ensembles that are comfortable, not too form-hugging, work with closed-toe shoes, and, most of all, make her feel fab. It’s hard being a woman in a field still dominated by men—on top of all the general cultural messages women get about appearance = values, she has to deal with male colleagues making sexist comments about female coworkers’ physical attributes (yech, misogyny). What if you fail miserably in fashion sense and have no idea what cut works for you? I’m so bad at fashion. I base my wardrobe entirely on comfort; all my stuff that I love is not suitable for work. So I have a bunch of work clothes that work – ha – but I don’t love them. Today, we will tackle her dilemma in 5 fun steps, sharing generally applicable style inspiration along the way! 1. First off, focus on one area. It can feel overwhelming to deal with finding your own style for your entire wardrobe at once. Pick an area where you most need to rehab, or where you are most excited to rehab. The Sister: she loves her casual wardrobe but really wants to be able to fall in love with her work wear. Bingo. 2. What do you like that you already have? Having trouble figuring out what draws you to a favorite piece? Think about similar pieces you own but don’t love, and parse out the differences. Or try this thought experiment: imagine if you could have multiple versions of the piece(s) in question—what would you change about them to give you some variety? The thing that doesn’t change in this mental experiment will help you narrow down what exactly speaks to you about the piece; the variations will help generate ideas for similar items to stock up on. The Sister: “I have one pair of jeans that I loooove, and I wear those to work occasionally.” What do you love about those jeans? If you could transform them into non-casual-Friday work pants, what would you keep or change? The Sister also mentioned a shirt she LOVED but recently donated due to being a repeat offender on the brastrap exposure front. What did you love about that shirt? Can you find a version that’s not so gappy up top? Write this stuff down, it helps articulate your vision!! This one’s fairly common in posts on how to define your own style; bloggers usually recommend Pinterest and other style blogs. Those are helpful, but they can also tempt you to imitate someone else’s style, confusing looks you love on OTHER people with looks you love on YOU. This is why doing step #2 first is so important. Once you know what some of your most-loved colors/silhouettes/cuts are, you can look at what others do with them: flowy on top and sleek on bottom; print mixing; blazers to formalize otherwise casual outfits; chunky military boots with a dress or trousers, etc. Those caveats registered—with the additional caveat that The Sister digs pants while many style bloggers overload on skirts/dresses—here are a few blogs and outfit posts to get The Sister’s fashion mojo revved up, and maybe your own, too! No longer posting but has some good archives; mixes fun things like skulls and steampunky bits into work-appropriate ensembles. Man I love puns. Two astronomers show you how to put the stars in your style—galaxy-covered work appropriate blouses, C3PO oxfords, aurora borealis infinity scarves, etc. 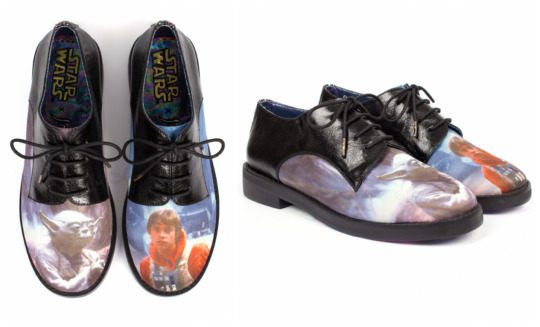 If your work culture isn’t super conservative, don’t be afraid to show your geek/nerd side in your work ensembles! Personal style is, after all, all about letting your personality shine through (pun, yes, intended). 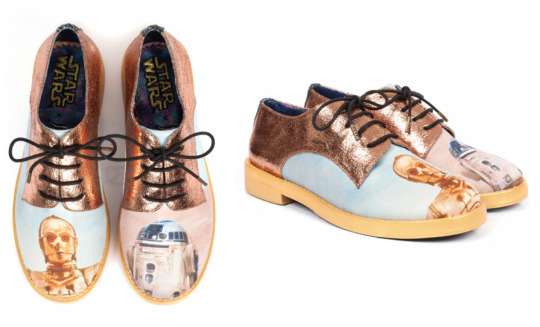 The Sister has a birthday coming up for which I would be willing to purchase some retail shoes… just sayin’. 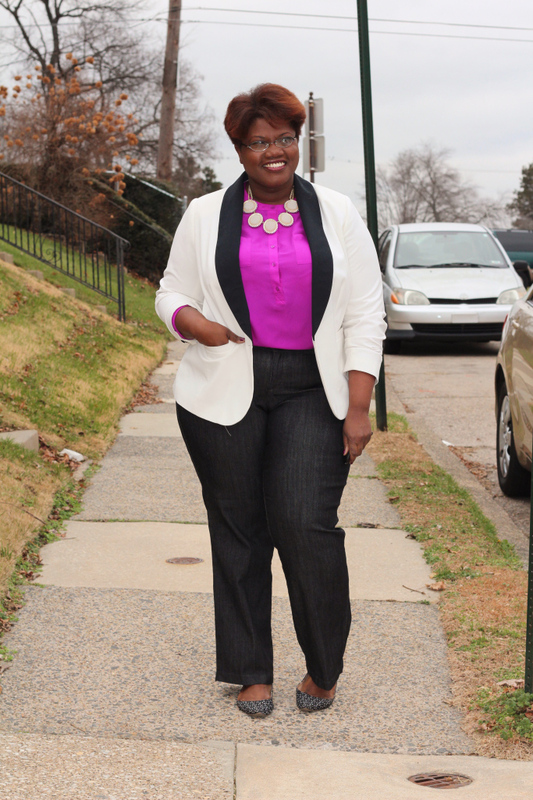 Assa at My Curves and Curls tends towards va-va-voom skirts/dresses, but she has some fab pants looks, too. The Sister has a long sweater vest like the one on the left and looks great in it; a very chic topper. 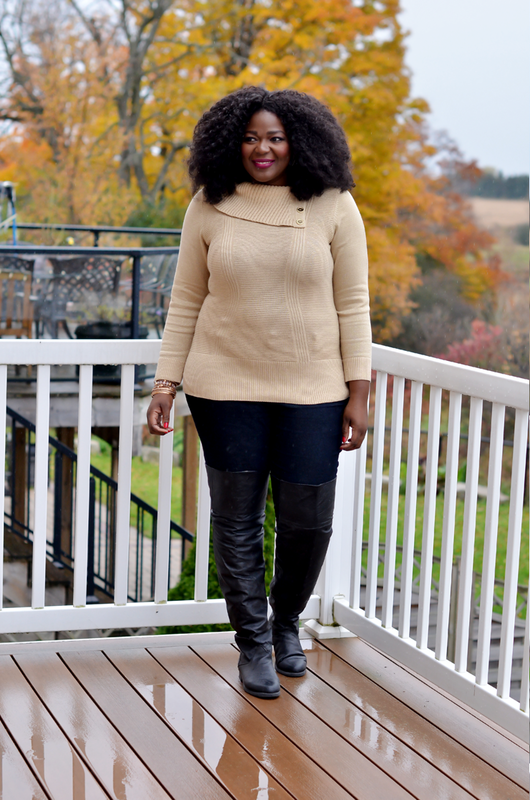 The sweater-over-pants with knee high boots is a great fall look and it’d be easy to swap out Assa’s colors for ones you love. Check out her selection of capes & ponchos for plus sized folks here. Kellie Brown from And I Get Dressed likewise loves the skirt/dress look but rocks pants as well. A casual jacket in a print you love can pull together your whole outfit (left); I think The Sister would look super chic in the sweater wrap over slim pants combo (middle) and the drape makes it less form-fitting; printed pants (right) might be a stretch but they really boost a simple shirt/combo while pulling attention away from decolletage (shape up, sexist coworkers!!). Just Jacq brings color and pattern to ensembles without being overly fussy or “girly.” A colored cardigan + printed button down (left) adds interest; convert grey jeans => to grey or other neutral trousers for work. Wear some statement jewelry (e.g. your favorite cephalopod necklace) with a simple tee to show it off (2nd from left). Mix a fun printed tee you already own with a blazer (2nd from right) for a work appropriate look. The longer dress with cardigan and ankle boots in fall hues (right) would look gorgeous on The Sister, and the cut and coverage keep it from feeling too revealing. Swap Grown and Curvy Woman‘s hot pink for a less attention-nabbing hue (The Sister loves orange; any fall tone would look great on her), then steal her jacket/blazer over a blouse and pants look. Those oxfords on the left would be totally work appropriate AND let The Sister show off her awesome socks collection. An Olive a Day is now defunct but here are a few more staid, work-able outfits: swap trousers for jeans on the left, and closed-toe shoes for sandals and a flowy tunic print of your choice on the right and you’d be good to go. Oh, and you might want to remove the sunglasses once inside the office. Once you know some things you love, and you’re armed with some inspiration from the interwebs and your everyday environment, it’s time to try out something new. This is where thrifting is your friend—you can afford to buy a few new-to-you pieces without fear of sunk costs chaining you to stuff you may not love long term. My advice: take it one or two items at a time, really living with them for a few weeks before adding new stuff; that way you’ll have enough time to wear them with several different outfits and to have them grow on you, since it often takes a few tries to embrace a new style element. After you’ve said yea/nay to the first few pieces, go try a few more (easy excuse: donate the “nays” on the same trip you go looking for more “yeas”). The Sister: She has the unbelievable luck to live near a PLUS SIZED THRIFT STORE. Holy thrifting unicorn, Batman!! I am trying to figure out how to fly myself out there for an in-person consult/to experience this wonder with my own 2 eyes. (Donations welcome.) Otherwise, it’ll be the FaceChat virtual consult OF MY DREAMS. Now it’s time to figure out how you feel about new acquisitions and new ways of combining them with old favorites. My biggest tip here: take photos of your outfits to 1) give you perspective on how the ensemble actually looks and 2) help you remember what worked/what didn’t. The Sister: She ain’t on IG that I’m aware but she could easily snap a quick photo in the mirror at home or at work, or have her spouse take one for the full-length effect. It’s easy to store these on your phone or computer for review later if you’re not thrilled about sharing your style transformation with the world. 6. Go Forth and STYLE! Once you’ve lived into new items and determined what you love, replicate the things that already work but in different styles/colors/lengths/weights to give you some variety. Click here for some other takes on how to build your personal style from scratch (second resource from top). What are your strategies/tips for improving your sartorial style? Do you have any blogs, IG, Pinterest, or Tumblr feeds you think would help The Sister or our readers? Scroll down to comment! ← Should You Care about Fashion? Also, from friend Ashley who emailed me directly with some tips—I’ve definitely seen Dress Barn Women at thrift stores; not sure about Torrid. Torrid in general is a great store if your sister hasn’t been there – there’s a lot of trendy stuff, but also nice pants and basics. Crystal has also had good luck at Dress Barn Women, especially for tops. They have KILLER sales, so she should wait until there’s a good one going on since prices can be a bit high without the sale. Also, she’s probably going to have to use accessories more than regular business casual clothes to self-express. Pros are that they tend to be less expensive, you can mix and match, and she won’t have to buy a lot of new pieces. I love these looks and the thought of taking notes on what makes me feel good. Thanks for the suggestions! 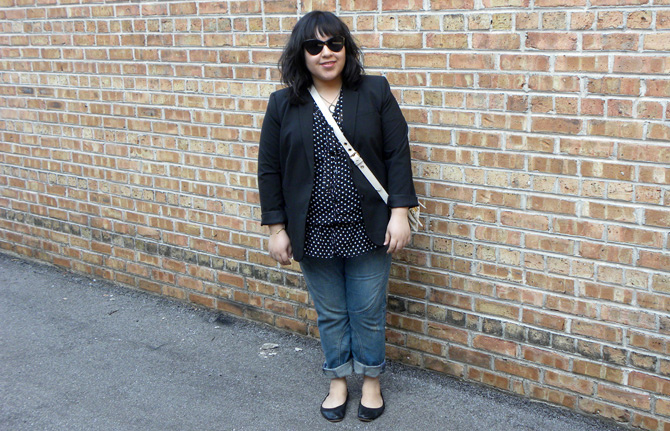 The jacket or cardigan over lighter weight shirts is great, and I use that as often as I can! My only restriction is the snug-waisted high-visibility jacket I have to wear. And getting dirt on nice pants. It’s harder to wear stuff you love when you might get jet fuel on it. The Broad Experience podcast above has an engineer with exactly that take weighing in. Thrifting might be a great resource in this case because even though you still don’t want to ruin pants you really like, it’ s a little easier to stomach the $5-7 you paid for them than the $70+ you’d pay for retail. Do you have some days you KNOW you’ll be in the field vs. in the office? Wonder if you could have special tops that fit under the jacket and pants set aside for field days in a sturdier fabric, e.g. Dickies work pants type of thing.